A few Books Worth Reading... I even carried these across the ocean! Along my path of life I have collected a pile of books that have shaped the very story of who I have become over the years. I gathered up that pile of books, put them in a big suitcase and brought them with me to Italy. If they are worth toting across the ocean, they are worth talking about. My love for books started the summer after I finished second grade. I was traveling with my family all over the USA. Every weekend our family would participate in an art festival. During the weekdays we would camp, travel or visit friends. Along the way and around the campfire my mom would read out loud to me and my three sisters. If we weren't reading books together we were playing board games, cards or singing along with my dad and his guitar, but mostly we were reading. One night my mom was laying down with us kids reading through The Chronicles of Narnia, by C.S. Lewis, it was getting really late, and I didn't want her to stop at chapter two. So she said "I'm going to bed, but you can read ahead if you want to." And she handed me the book. I flipped through the pages, the words were tiny, the paragraphs were long, and there were no pictures, I was used to reading kid stuff like Curious George. But I wanted to read that book, I wanted to know what would happen next. I began to struggle through the couple of chapters. Then at some point in that book an amazing thing happened; reading became easy and the wonderful story simply filled my whole imagination. A passion for reading was lit and from that day on I was always in the middle of a book, or two, or three. True stories are my favorites. I love to read about real people who live by faith, who are not afraid to take risks, follow their dreams, and walk with God. I want to live the life that God created me for, no matter what the cost, no matter what the sacrifice. There are three auto biographies that I have read over the years, these are the people who have inspired me to live what I believe, even when it's scary. These are the people who gave me the courage to get on an airplane and fly to Hungary when I was eighteen. These are the people who inspired my husband and me to open our home to the kids in the neighborhood. These are the people who showed me by their lives that anything is possible when your faith is in God. These are the people who taught me to trust in the Lord to provide for all my needs. These are the people who sparked in me the boldness to write down my own stories and share them too. So I hope you make time to read these amazing story of courage, faith, and the faithfulness of God to His people. The Hiding Place by Corrie Ten Boon, L'Abri by Edith Schaeffer, and The Autobiography of George Muller, by George, of course. I love learning about the way things used to be, I love books that take me back in time. When I was fourteen I learned how to fall in love the old fashioned way when I read a series of books called Love Comes Softly by Janet Oke. The author had a way of planting me right into the lives of a facinating pioneer family, and I've had one foot in the 1800's ever since. We live in a world that doesn't know what love was meant to be, these innocent stories would be a wonderful way to introduce your daughters a lifestyle of honor, beauty, dignity and sweet old fashioned romance. I came across another book showed me practical ways to create a home full of peace and beauty. Let Emily take you from the kitchen, to the garden, from the front porch to the fireside as she shows you how to make your house a home in The Spirit of Loveliness by Emilie Barnes. There are two great books that prepared me for motherhood. I read them both when I was expecting my first baby. One was very practical and has provided me with the knowledge and confidence to go ahead and give birth six times, that book is called The Birth Book "Everything You Need to Know to have a Safe and Satisfying Birth" By William Sears M.D. & Martha Sears, R.N. I've recommended this book to countless women and couples. The other book prepared me for the adventures of mothering This one will keep you laughing as you read one mother's account of raising her own four silly and lovable kids. It's called Worms in my Tea and Other Mixed Blessings, It's by Becky Freeman, I bought three of her book's on one Volume called "The Best of Becky Freeman" Eight years about I found it for about $10, but I saw it on online today for seventy-five cents! One summer day, just after my twenty sixth birthday, something happened. I had a new baby, this was the third one in less than three years. I needed help in a big way. I didn't have enough arms, or enough hours in my day to get everything done, I was worn out by breakfast time and everyday was like a storm. Emilie Barnes came to the rescue with a book called More Hours in My Day. This book was just what I needed to get my life, my home and my calendar in order. Emilie shares her own story of suddenly becoming the mother of four children, all under the age of four, and shortly thereafter finding out that number five was on the way. She told me what to do, and I did it. Her method's worked, and I found out that with God's help I was able to make my home a place of peace once again, even with a house full of babies. Now that I have six small kids I think I need to read that book again. It's easy to fall into pace with our busy, stressed-out society. A few years ago our family ended up back in the rat race. That was not where we wanted to be, but we couldn't even figure out how it had happened. We were not sure how to get out. We felt trapped. A good friend game us a skinny little book called Henry and the Great Society By H.L. Roush Sr., I stayed up until about 2am with this book, and made my husband read it the next day. That was all it took for us, about five minutes after Josh closed the book we opted out of the rat race and got our priorities strait, and we almost moved to a log cabin with no electricity and no running water. If you are serious about figuring out what happened to make such a big mess of the American dream please read this book. It's hard to find, but I have some extra copies of this book and many of the others I've mentioned and I'm happy to share them. Another very practical book both my husband and I love is Family Friendly Farming "A Multi Generational Home-Based Business Testament" by Joel Salatin. You don't have to be a farmer to NEED this book. But if you are a farmer you've got to get your hands on this book. If you have ever dreamed of owning your own business get this book. If you have ever considered living a life that will inspire your children to want to follow in your footsteps read this book. If you care about the generations to come forth in your own family you must read this book. If you want to establish a successful family business this book is bursting with practical ideas that really work. Have you ever dreamed of fulfilling your special purpose in life? Do you feel like you have been giving a unique calling? Do you have a dream but you are afraid to take that first step? Are you a visionary who needs a kick in the pants? Is something holding you back from reaching your goals? Are your dreams starting to fade? Are there people in your life that laugh at your hopes and dreams? There's a little book for you called The Dream Giver By Bruce Wilkinson. I have a favorite magazine too, it's called Above Rubies, and the subscription is free. Inside you will find a collection of stories from women all over the world, mostly mothers. This publication is so encouraging for mothers and homemakers. I often publish my stories in Above Rubies too. Visit AboveRubies.org if you are a mom who needs hope and inspiration. The last few books that I want to tell you about are the ones that I love to read out load to my kids. I doubt you have ever read the tales of Brambly Hedge, these are the most beautifully written and illustrated stories for children that I have ever read, perfect for children of all ages. I've even picked up the books after we have tucked the little ones in, and read these delightful stories to myself. I could look at the pictures for hours and I don't mind reading the same stories over and over and over. 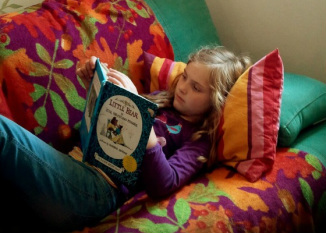 Our favorite three favorite Brambly Hegde Stories are The Secret Stair Case, Poppy's Babies, and The High Hills, but all of Jill Barklems stories are captivating and simply wonderful. Just before moving to Italy a new book caught my eye, and I bought it. Kisses from Katie! All my girls love this book too. Before reading Katie’s story I thought I had a hard life, I thought I made a lot of sacrifices, Katie gave me a fresh perspective and helped me open my heart to more of God’s plan for my life. I hope that some of my favorite books find a way into your heart and home. I hope that as your read them you will find the courage to live what you believe. I hope that the help you figure to out how to get your priorities in order. I hope you discover a path for your dreams, I hope you follow that path. I hope that you realize that the sacrifices of earth bring us the treasures of heaven. I hope that you find a fresh reason to laugh, love, and use your imagination. But if you don't have much time for reading, make time for the greatest book of all, the number one best seller ever, a love letter from the Creator Himself... so even if it's just a few verses a day be sure to read your Bible.